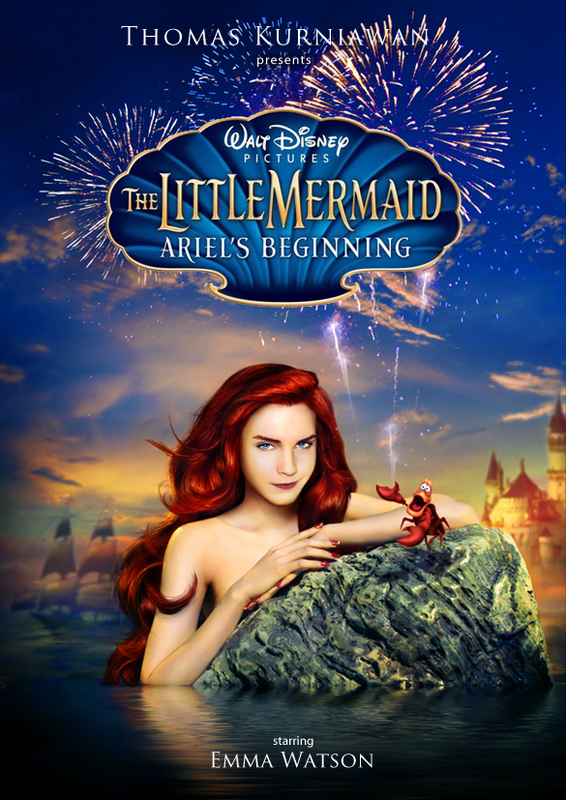 Still using Emma Watson for Ariel's Role.. Awesome work! 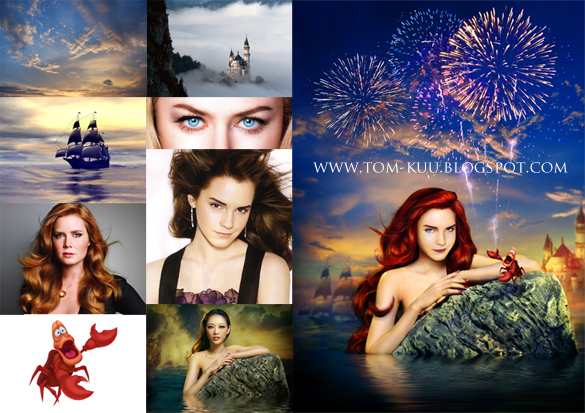 Emma Watson is the perfect Ariel! Waouh. at the beginning I thought that Emma was a bad choice, but here she is very pretty. I think Amy Adams would make THE PERFECT Ariel!!! Its incredible!!! Awesome.. can you please try to change emmas face for taylor swift face :) please ill love it.. I love how it looks with emma, but i want to see taylor with that hair and background... PLEASE PLEASE PLEASE..
PS. I LOVE your art... what program do you use??? Im agree: Taylor Swift: The Little Mermaid Selena Gomez: Snow White Miley Cyrus: The Sleeping Beauty DEMI LOVATO: BELLE PLEASE PLEASE PLEASE PLEASE PLEASE!! Who else wants this!!!??? please do jennifer lawrence as cinderella! These are amazing! I think you pretty much nailed it with Tangled, Snow white, Aurora, Belle, the new mulan, Brave and especially the little mermaid! 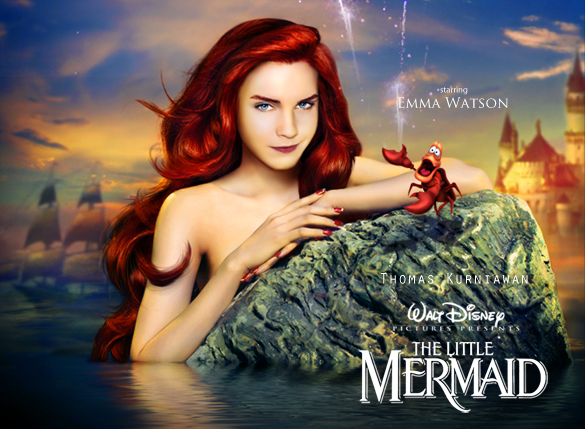 i think we all wish that Disney could make that movie!!! You're artwork is really really great, and creates hope every where! You MUST never stop :), you have a gift and huge amount of talent. Thank you so much for making these!!! I think with Poccahontas you can still do better(probably because she was my favorite as young), but i like the second poster better the colors suit her better than the waterfall mist one! Poccahontas is a very strong character, and has a pretty wide chin in the original disney posters. For Jasmin as well I think you could do better,Maybe Mia Kuniz is a good option. very critically the last poster the face is very narrow compared to the hair, but thats it! That is the only critique i could find amongst all your pictures, and it is only my opinion. Your photos are again really really good, and the attention to detail you have in them and the color chosing is amazing. ps: any chance you would try and fit keira knightly for any princess role? also can you do the frog princess when and if you get time? bagus bangettttt.... sukses ya mas thomas! loved all the characters of Disney.!!! they re beautiful ! Except for this mermaid. she is beautiful but doesnt really reflect Emma Watson. right?? lots of changes? You sure got a talent. Never stop making lots and lots of masterpieces. I love photoshop too but never can edit like you do. It is great and amazing. Keep fighting. If I don't see last two pictures and notice, I almost believe it's a real film being shot. Wonderful work!